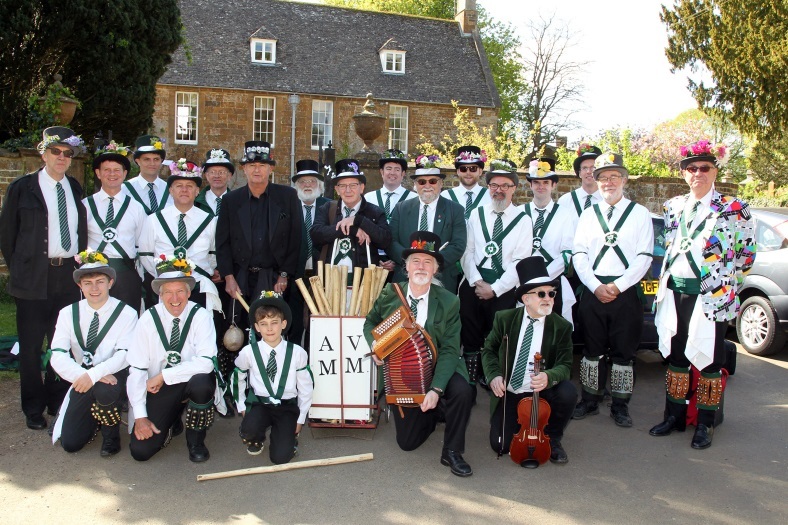 On Saturday 22 April, the sun shone all day on Adderbury for the annual Day of Dance. Squire John Ekers writes: Thanks to all who contributed to making Saturday’s Day of Dance such an enjoyable celebration of Morris Dancing during which AVMM danced on 55 occasions. I was really proud of our four new recruits who have been such receptive and enthusiastic students of our unique style of Cotswold Morris since joining us at our Taster session just nine weeks ago. Thanks also to our wonderful musicians and more experienced dancers who helped so much, both during practice sessions and on the big day. Some personal thanks from me to those who helped with calling the dances and to Bryan, our fool, who always keeps the audience entertained. We were blessed with perfect weather for dancing and large, friendly crowds helped us to keep going from 10.30am when we started the day in the churchyard until 7pm in the evening outside The Bell. Unfortunately, Charlie, our horse, had to retire early as Dave Lovick, his jockey, took a tumble and injured a hamstring. We wish him a speedy recovery and hope to see him back in the saddle later in the season. Finally, a special mention to our youngest member, Alfie Newman, only nine years old, but already a seasoned veteran of this annual highlight of the Adderbury calendar. As well as performing the Shepherds’ Hey jig with his grandpa, Chris Garrett, four times during the day, he extended his repertoire, tackling many dances which were new to him. Here’s to a successful and enjoyable season ahead!